But Republicans at the statehouse now say they're shocked at just how much Evers' proposed budget would spend. The Legislative Fiscal Bureau this week said Evers' two-year state budget would spend $2 billion morethan Wisconsin has to spend. "The LFB numbers are worse than the initial analysis when the budget was first introduced a few weeks back," state Rep. Jeremy Thiesfeldt said. 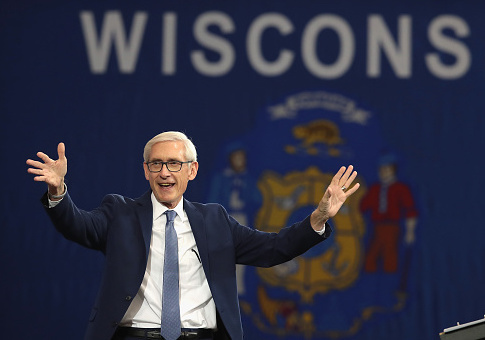 "The fact is that the longer the voters of Wisconsin examine Tony Evers' budget, the more it seems to spend and the higher their taxes go." The LFB report shows Evers wanting to spend $19.7 billion next year. The state will only bring in $18.8 billion. The spending gap is even larger in the second year. LFB shows Ever's plan would spend $19.9 billion, while Wisconsin would bring in the same $18.8 billion. "He plans to burn through $1.8 billion in projected new revenue, raise taxes over $1 billion, allow property taxes to increase, and then still have a nearly $2 billion deficit," Thiesfeldt added. State Rep. Ron Tusler said he sees the governor's budget not as a specific, detailed plan for managing state government, but more of a policy statement coming off an election. "This is the exact opposite of budgeting," Tusler said Tuesday. "This is asking for everything you can think of, and throwing the whole kitchen sink and seeing what sticks." Tusler and most other Republicans in Madison say Evers' budget ends in one place: With higher taxes. "Our state right now is in a good fiscal place. We've been really responsible in the past," Tusler said. "And to increase the size of our government by 10 percent, to increase the amount of spending so that at some point we'll have to tax people at more than a thousand dollars more per person. That would be irresponsible." This entry was posted in Politics and tagged Republicans, Wisconsin. Bookmark the permalink.